Includes one discount colonial man wig. The wig features an elastic band for a comfortable and secure fit to almost any head size and is available in a wide variety of colors. 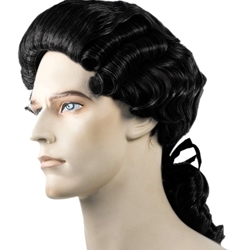 This wig has a high combed back top, with barrel curls on the side, and is pulled back in a ponytail tied off with a ribbon. This wig is used to create a colonial period look for book reports, school projects, period plays, and historical costumes.